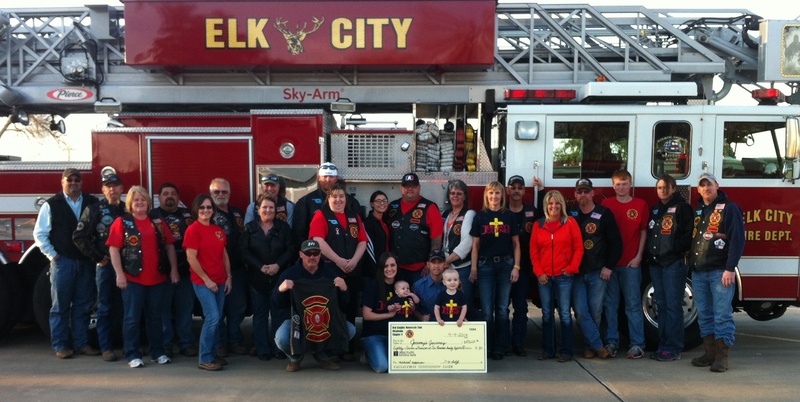 With the help and generosity of several communities, the Red Knights Motorcycle Club ? Oklahoma Chapter 8 held the Jeremy's Journey benefit to help Jeremy Chester's family with medical expenses. Jeremy is the son of Mark and Jayme Chester of Elk City, OK. Mark is a firefighter for the Elk City Fire Department. Jeremy, now 2 years old, was born with Hirschsprung's Disease, a disease that prevents his colon from functioning properly. Since birth, he has undergone numerous medical procedures and surgeries, and has made hundreds of visits to hospitals and doctors' offices. Just recently, Jeremy has been referred to specialists at a hospital in Cincinnati, Ohio. Specialists there believe they can remove a part of Jeremy's colon which does not function, thereby returning the rest of his colon to normal function. RKMC OK8 presented Jeremy's family with a check for $87,628.12 on April 4th, and combined with previous travel expenses already paid, they raised a total of $90,948.12.